Garden Adventures - for thumbs of all colors: Pint-sized or Super-sized? much easier to find room for. I love to design small gardens. 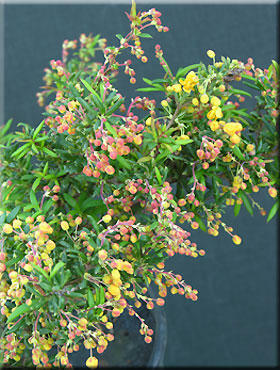 Attention to detail is key and so every tree and shrub is selected with great care, particularly with respect to size. Wisteria are fabulous trained across a massive pergola for example but those long tendrils can wrap themselves around unsuspecting homeowners faster than a cobra. Anything in its path from houses to heuchera are likely to be engulfed without frequent bushwhacking. Thankfully there are plenty of dwarf varieties of our favorite giants so we needn’t feel deprived and our gardens can still showcase an interesting array of beautiful plants. 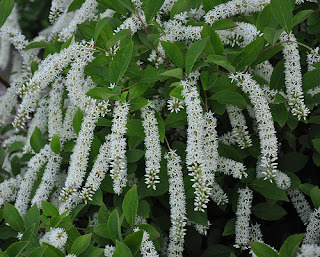 Virginia Sweetspire (Itea virginica ‘Henry’s garnet’) is one tough shrub. It tolerates wet soil or drought, full sun or shade, is ignored by deer and is one of those wonderful transition shrubs for bridging the gap between the intensely cultivated garden and the wilder views beyond. Fragrant white flower racemes cover the bush in early-mid summer, cascading over the green foliage like little lambs tails. Its real moment of glory is in fall, however, when the leaves turn a rich burgundy, often persisting for several weeks. How can you do better than that? Well I should mention that this variety grows 6’ x 6’. ‘Little Henry’ is the baby brother; equally enchanting but at half that size much more easily accommodated. I suppose in all fairness I should also tell you that this is a suckering shrub so there will be more little Henry’s in your future although they can be given up for adoption. The area of England where I lived did not have acidic soil, so growing rhododendrons, camellias and similar shrubs involved special fertilizers and top dressing with peat to adjust the pH. In fact the first time I saw an Andromeda (Pieris japonica) was on a trip to Perth, Scotland where the native soil allowed these beauties to thrive. Moving to the Seattle area I was very excited to discover that I could now enjoy these in my own garden and looked forward to the intoxicating lily-of-the-valley fragrance from the dangling flower clusters every spring. Most varieties grow to 4’ tall which is a fairly modest size but I have been thrilled to discover two dwarf varieties which I now use for container gardening or for creating an elegant groundcover. ‘Brookside’ is an all-green variety which grows to about 2’. It still displays fragrant ivory spring flowers amongst its paler colored new growth while the foliage seems to grow upwards in tiers. Delicate and pretty. My favorite has to be ‘Little heath’ however. This is a beautiful mounding variegated form that has spectacular coral colored new growth and masses of fragrant white flowers. 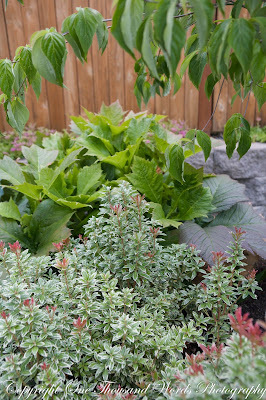 I have planted this as a carpet underneath the white flowering dogwood tree (Cornus kousa) and love the way the dogwood flowers echo the pretty variegated leaves of the shrubs below. The bright new spring growth of ‘Little heath’ also makes a wonderful color companion to copper and burgundy toned foliage such as Rodgersia ‘Rotlaub’ pictured here or Heuchera ‘Peach flambé’. Outstanding. Fireglow Japanese maple fits well into small gardens. heuchera for a gentle color echo. Who doesn’t love Japanese maples? In the nursery they all look so enticing in their 5g pots….and then you read the label. Why is it that all the ones you like grow 20’ tall or more? Of course that is always hoping that the label is correct. I have been caught out a couple of times and now carry the Timber Press ‘Pocket Guide to Japanese Maples’ by J. D. Vertrees. This author is considered the authority on all things maple so I’ll trust that book over any nursery tag. One of the most popular dark leaved Japanese maples is ‘Bloodgood’ (Acer palmatum ‘Bloodgood’) which retains rich burgundy foliage even in full sun before turning fiery shades of crimson in fall. Since it will eventually reach 30’ tall, this may not be for everyone. 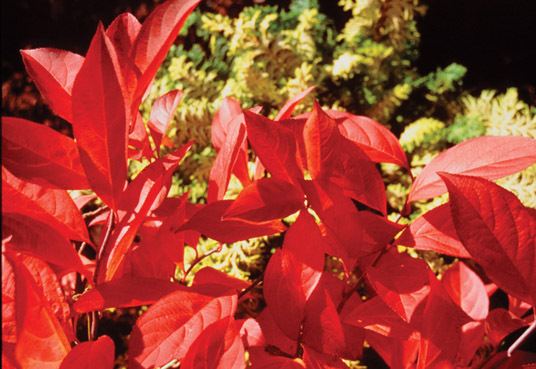 ‘Fireglow’ is very similar in form and color but grows to about half that size. The coral bark maple (Acer palmatum ‘Sango kaku’) is stunning in any season, whether exposing its bare colorful branches in the depths of winter, the fresh bright green foliage as it emerges in spring, each leaf tipped with red or the orange-golden shades of fall. Not everyone has space for its mature size at 25’ high and 20’ wide as this is quite a broad spreading tree. There are several other varieties better suited to small gardens and containers. ‘Beni kawa’ is one and has the added benefit of keeping its coral red bark coloring longer and also grows a little shorter at about 10’ in 10 years. ‘Redwood’ is similar at 10-13’. Finally the variety ‘Fjellheim’ is even shorter (6’) and bushier making it ideal for containers. Now just think; if you choose smaller plants, you can buy more…. Oh darn. What Sort Of Gardener Are You?